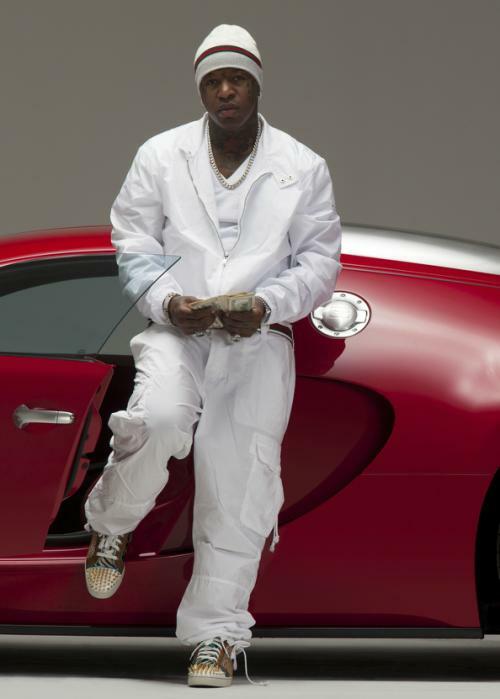 With all of his elaborate possessions - from jewels to cars and homes; his cash money making ventures- from music to videogames to shoes and clothing; Bryan “Birdman aka Baby” Williams is poised to continue shining in everything he does. In preparation for his latest release, the Cash Money co-founder, CEO and platinum-plus star has kept busy. Having suffered loss and persevered to regain himself, Birdman spent the past two years performing with Cash Money signature superstar Lil Wayne. Fresh from their pairing Like Father, Like Son and the wildly successful single “Stuntin’ Like My Daddy,” Birdman is clear on whom he represents “we do our music for the people,” and the people kindly acknowledge him in return. The first single and video from 5 Stunna, “Pop Bottles” featuring Lil Wayne, sounds like classic Cash Money. Reminiscent of the archives from the CM vault, time spent with the Hot Boyz and Big Tymers, the speeded up synthesizer that pounces like a southern bounce record, yet creeps in on the low, is contemporary, five-star quality. When Birdman and Wayne crafted the lyrics for the track, they were doing what they do, toasting their recent success ‘poppin’ bottles. One of the blessings Birdman received was a star studded collaboration with the Cool & Dre produced second single and video, “100 Million.” Representing the new Cash Money, coupled with the vibe and beauty of Miami, DJ Khaled provides the ad libs over the airy track almost befitting of rock anthem status in sound. Lil Wayne, Young Jeezy and Rick Ross lend their own unique brand of braggadocio into the mix lyrically. Beyond his music, Birdman expresses his feelings through the artistic medium of tattoos. As the teardrops on his face symbolize loss, the rest of his body has been utilized to heal beyond the suffering with each tat representing blood, love and money. With his hometown still in recovery from the devastation known as Hurricane Katrina, “Love My Hood” is a story Birdman continues to share. The piano creeps in on the TMIX (Cash Money in-house producer) track as Birdman identifies his hometown pride while recognizing his desire to live life to the fullest because you never know when it will be taken away from you. What it’s like for the Birdman is a constant grind with him at the helm of his ship and in control of it all. “It don’t ever stop, you got to be able to wear as many faces as your range can go.” 5 Stunna represents his evolving music side while the entrepreneur is preparing for the release the next installment of his wildly successful Birdman Shoe Collection via his endorsement deal with Lugz in the summer of 2008.